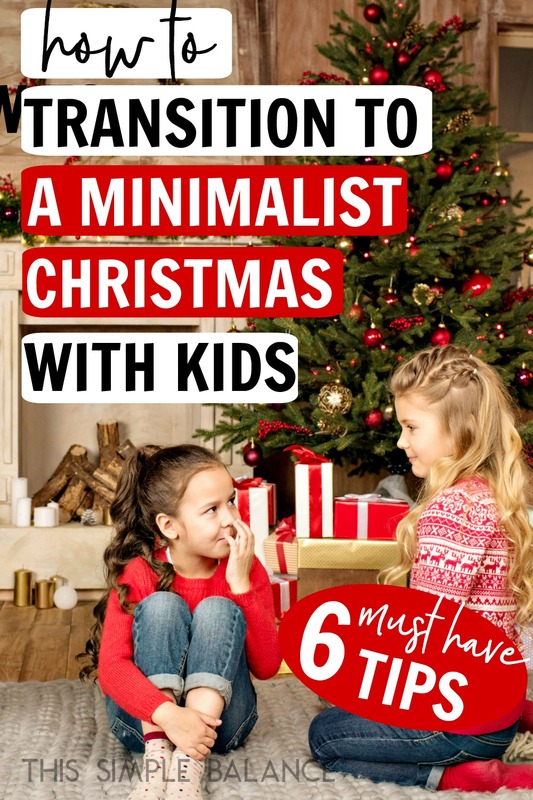 Inside: How do you transition to a minimalist Christmas when you have kids? Especially when every other Christmas meant presents galore? Get actionable tips to make the transition as smooth as possible. The idea of a minimalist Christmas has rapidly gained popularity over the past few years. Parents around the world are realizing that more activities and more presents do not happier kids make. In fact, more, more, more, especially during the holidays, tends to have the opposite effect. I’ll never forget one Christmas spent with extended family six years ago. I have literally never seen so many presents under a Christmas tree in my entire life. While I was very touched by their generosity, I simply couldn’t believe how many presents there were. I wasn’t a minimalist at the time, and even then, I was overwhelmed! And my then three-year-old daughter? She couldn’t even make it halfway through her presents before she started looking anxious. Relatives on all sides encouraged her to finish opening her presents, and all she wanted to do was play with the ones she already opened. The truth is, more Christmas presents tend to cause anxiety in kids and frustration for parents. Just a few days after Christmas, all those presents? They’re lying in the corner of the playroom. Forgotten. Gathering dust. And the kids are walking around the house saying they’re bored. SO frustrating as a parent, but also avoidable. If you’re wanting a Christmas with less stuff and more joy, you probably have already started pursuing a minimalist lifestyle. But if you haven’t, I want to make sure you know that a minimalist Christmas might not go over very well if you haven’t adjusted the rest of your life to match. Your kids will have a much easier time adjusting to a minimalist Christmas if you’ve already decluttered and are practicing minimalist buying habits. They will understand that having fewer toys to play with and less stuff is a good thing. They will have seen the benefits firsthand (minimalism equals a happier mama, for one). If you’re trying to do a minimalist Christmas and your playroom is overflowing with toys, your kids will probably be more than a little confused. If previous Christmases meant getting everything on their wish list and then some, they might be downright resentful (Why are you ruining Christmas?! Are you the Grinch?!). Decluttering right before the craziness of the holidays may not be possible. In fact, I’m not sure I would even recommend it. Although if you have a fire lit under you, and you want to start decluttering ASAP? DO IT. 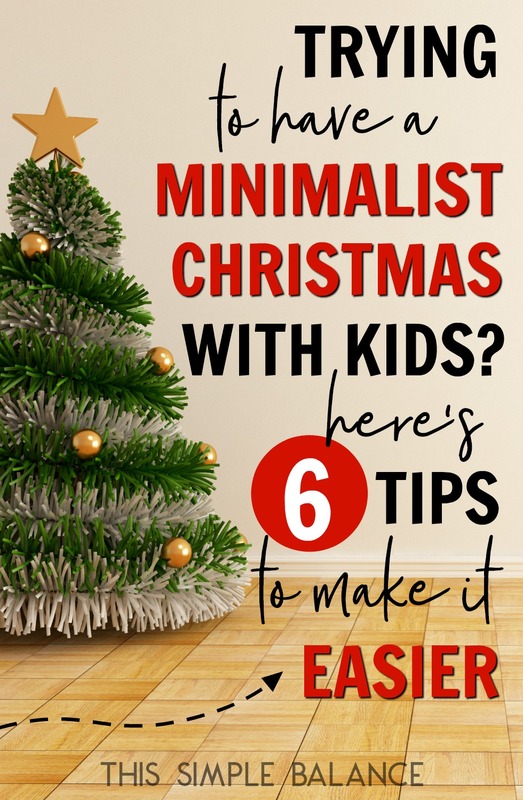 Just know that if you want a minimalist Christmas and you’re just starting your minimalist journey with kids, your transition might need to be more gradual (see tip #6!). A minimalist Christmas can offer you a more peaceful, enjoyable, and satisfying Christmas. But how do you actually make the leap from Christmas morning consumed with opening a gajillion presents to one with only a few per person? Make the transition a little bit easier with these tips. 1) Give relatives a heads up, and ask for fewer (and different) gifts. The first tip could prove to be your most difficult task. What relatives give or don’t give is largely out of your control, and I don’t recommend outright rejecting offered gifts. A major part of my minimalist journey has been learning to graciously receive gifts, as they are generally given out of love and a generous spirit. This conversation absolutely needs to be a tactful one. The best thing you can do is make your relatives aware of your desire for a minimalist Christmas. You can share about your minimalist journey as much or as little as you like, depending on what you think would help them get on board. See if they would be open to giving experience gifts, instead: museum passes, movie tickets, restaurant gift cards. At the end of the day, however, remember that you can only control you and what gifts you buy. If you know a ton of gifts are coming your way no matter what, consider drastically reducing your own number per child and make their gifts useful and/or experience-based. 2) Get your spouse on the same page. If your spouse doesn’t share your minimalist ambitions, your next task is to get them on board with a minimalist Christmas. How you make your pitch will depend on your spouse’s personality. “Let’s just try it and see.” Ask for a one year experimental Christmas. If you’re struggling to agree on the gifts, see this post for more tips on what to do when parents disagree on what to get kids for Christmas. 3) Be ready with new Christmas Eve/morning traditions. If opening presents previously took all morning, and the rest of Christmas day was spent playing with new toys and gadgets, your biggest concern might be filling the time. It’s time to think about creating new Christmas traditions that prioritize spending time together. Do a jigsaw puzzle as a family. Have a Christmas scavenger hunt. Notice there’s a whole lot of “together” in that list. Your goal is to shift the focus of Christmas from giving each other stuff to spending time together. Whatever you decide to do to fill that empty space, make sure you have a plan! You also need to talk about the new Christmas traditions enthusiastically with your kids…. 4) Start preparing your kids NOW. If you are going to make drastic changes to Christmas, you need to prepare your kids early on. Talk to them about the benefits of having less stuff. Discuss the changes to Christmas day itself: how you’ll probably be spending less time opening presents and more time doing things together as a family. Have them make an “ideas list”, instead of a “wish list”. In my experience, kids tend to see wish lists as guaranteed gifts. If it’s on my wish list, I’ll automatically get it. An “ideas list”, on the other hand, is more flexible. You can explain that they won’t get everything on the list, but you’d love to get some ideas from them of things they’d like to receive. The simple word change probably doesn’t sound like it will make much of a difference. But you’d be surprised at how changing one little word can help them make a huge mindset shift. It can completely change how they see their gift requests, and Christmas itself. 5) Wrap everything – from parts of the presents themselves to individual stocking stuffers. This is something I’m just starting to do this year after reading this tip on a frugal living blog (I wish I could remember which blog!). Think about it: what do little kids love most about Christmas presents? Unwrapping them! In fact, the excitement of the unknown and discovering what’s inside is often more exciting than the present itself. Take advantage of that and make that one thing familiar – lots of stuff to unwrap – when in reality, you’ll have fewer presents. Wrap every little thing that goes into their stockings. If gifts have a few different parts to them (like a book set for example), wrap each individual part of the gift. Giving multiple packs of gum in one stocking? Wrap each pack of gum. It’s one way to retain part of what makes Christmas magical for kids, while actually decreasing the amount of physical stuff under the tree. 6) Use this Christmas as a transition Christmas if necessary. I don’t think you need to step down the giving over multiple Christmases. That drags out the transition to a minimalist Christmas unnecessarily and will likely add to a clutter problem. However, if your previous Christmases were extremely extravagant, a transition Christmas is something you may want to consider. If you are going to try a transition Christmas, and you have spent a lot of money in the past on physical gifts, put that the majority of that money towards experience gifts, instead. Choose a few physical gifts per child that are practical/useful, and perhaps one toy if they’ve been asking for it for a long period of time (and you believe it will be loved and played with, not decluttered by the end of January). Fill the stockings, but choose useful stocking stuffers or consumable ones. Once you’ve made the transition, a slow and simple Christmas IS amazing compared to the craziness that was Christmas before. But the initial transition to a minimalist Christmas isn’t always the rosy picture we minimalists paint. Even a minimalist Christmas isn’t completely stress-free. I still struggle when one child wants a specific toy that he asks for persistently for half the year, but that I really don’t want to get because I have a hunch it will be one of those “played with a immediately forgotten” Christmas presents. The benefits of a minimalist Christmas far outweigh the challenges, however. I don’t spend all of January regretting our purchases. I’m not overwhelmed by all.the.toys. five minutes after all the presents have been unwrapped. I don’t spend weeks organizing and reorganizing our stuff just to make room for the new additions. Christmas is not nearly as stressful as it once was. Spending a Christmas or two making the transition to a minimalist Christmas is worth the effort. What are you doing to make the transition to a minimalist Christmas easier? Share your best tips in the comments!